It was only recently that we started to witness any drama in the RPScore Top 5. 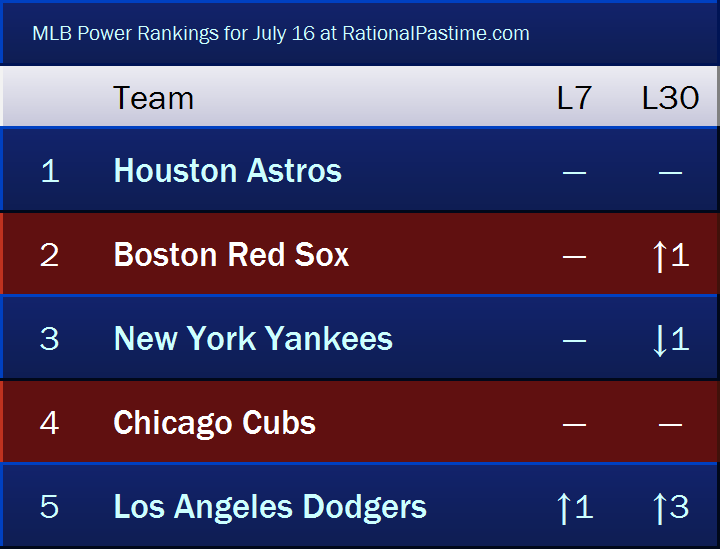 The Houston Astros have been in control since May, but the Boston Red Sox are charging hard, recently surpassing the New York Yankees to take over the second spot. Meanwhile, the Chicago Cubs and Los Angeles Dodgers have supplanted the Cleveland Indians and the reeling Washington Nationals to round out the list. Let's take a look at how we got here, shall we? It's not that the Red Sox weren't going to be good, it's that now they're looking real good. The actual surprises are in Seattle and Oakland, where the Mariners and A's were just supposed to be meh and meh, but now the latter is looking really okay and the former is looking like "oh, wow". On the flip side, remember when I wrote that the New York Mets might not be bad this year? Yeah, they're looking pretty bad. Looking worse are the Baltimore Orioles and the Kansas City Royals. For once, the Birds are underperforming, while KC is matching them step-for-step in the quest for historic futility. Nearly as surprising (in a good way) are the Tampa Bay Rays and Atlanta Braves. Back in March I projected both teams to finish under .500. Today, the Rays look to finish with a respectable 84 wins while the Braves are nipping Philadelphia's heels in the race for the NL East. Perhaps the most disappointing performance so far belongs to the hosts of the 2018 All Star Game: the Nationals. The team I (and plenty others) projected to win the NL East stumbled into the break playing the worst baseball of any team over the last 30 days, just two points better than their season low RPScore and sporting a .500 record. At the moment, the Nats are out of the playoff picture, four games back of the second NL wild card spot. 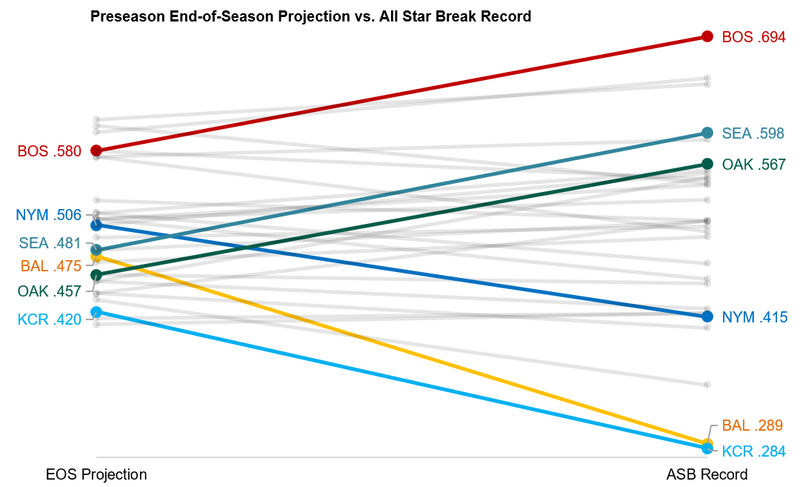 Washington's struggles aside, the biggest shocks have been the Mariners' success as well as the general gap in performance between the American and National Leagues. 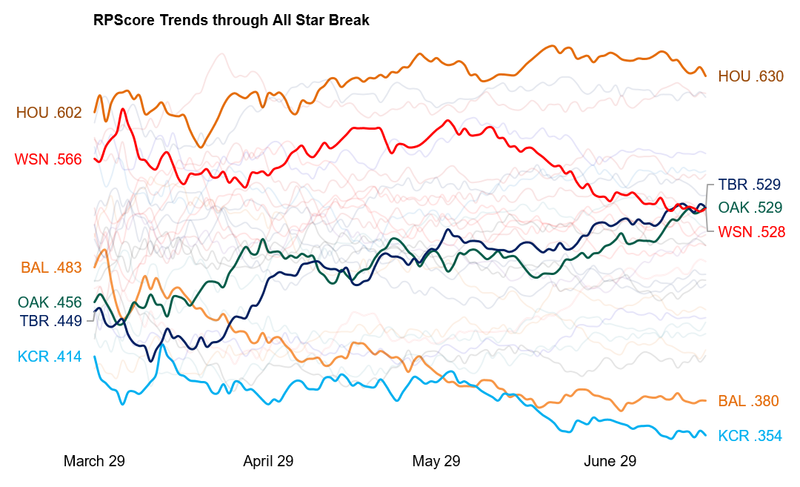 In the senior circuit, it's not unthinkable that two division winners will fail to win 90 games, whereas in the junior circuit we can currently anticipate a 100+ winner shunted into a wild card spot, most likely the New York Yankees. Nothing is set in stone, of course. 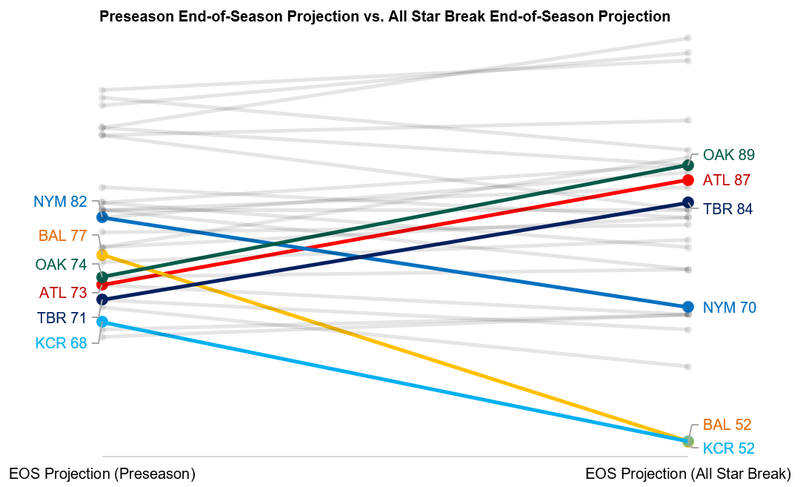 With nearly half a season left to play my projections still have an 80% prediction interval of +/- 6.7 wins, more than the gap between the NL's top seed and fourth seed projections. Keep stopping by Rational Pastime to see how your favorite (and least favorite) teams are performing and where they might end up come October.